It is the blue of beyond the seas: Ultramarine. This magnificent pigment helped to create some of the most beautiful paintings in history. And indeed, its color defines its name. Ultramarine is a deep blue color and a pigment which was originally made by grinding lapis lazuli into a powder. Ultramarine was the finest and most expensive blue used by Renaissance painters. So, all aboard, we will tell you about this magnificent charmer. Blue is the color of the dark side, the wonderful, the unfathomable, longing, and realization. In Morocco, a dab of blue behind the ear of the bride wards off the power of evil. In Jerusalem, a blue hand, painted on the door, offers protection for the house and its inhabitants. In East Africa, blue pearls signify fertility. While in symbolism, blue is the color of water. Water is the archetypical image of womanhood. In Christian tradition, blue is the color of the Virgin Mary. In Tibetan Buddhism, consciousness and wisdom – called Dharma-dhatu and considered attributes of the immortal androgyne – materialize as a radiant blue. The god Krishna has blue skin. In Chinese medicine blue corresponds to the Dan-Tien, the heart chakra. It is related to respiration. The esoteric tradition of China associates blue with immortality. Shades of blue are described as shallow or deep instead of light or dark in China. The blue city in Judaic tradition is the city of the immortals. High-quality lapis lazuli has been used as a mineral pigment for over 1,000 years. Bright blue pieces of lapis are trimmed of impurities and ground to a fine powder; the powder can then be mixed with oil or another vehicle for use as a paint. Higher-grade pigments can be produced by washing the powder with mild acid to remove calcite and dolomite that dilute the blue color. The material is then processed to remove grains of pyrite and other foreign minerals. This lapis-derived pigment was named “ultramarine blue,” a name that has been subsequently used for hundreds of years. Converting lapis lazuli into a pigment is not as simple as turning malachite into green pigment. It is a tricky process and today we will describe Cennini’s master formula to turn lapis lazuli into lapis pigment – ultramarine. Lapis lazuli means Blue Stone. Lapis is the Latin word for “stone” and lazuli comes from “lazulum” which comes from the Persian word “lazhuward” which is the name of the stone in Persian. It is composed of an accumulation of minerals not a single mineral (unlike rubies and emeralds); it is mostly lazurite, typically at levels of 30-40%. Lapis gemstone also contains calcite (white veins), sodalite (blue), and pyrite (gold flecks of color). The blue color of lazurite is more intense when there is greater quantity of sulfur anions. It is usually described as an intense blue to a gray blue. In its dark blue variety, the content of sulfur reaches zero. That is, for its use as a pigment, it is imperative to select the richest in Lazurite mineral and remove the aforementioned impurities. In the best quality stones, the color is uniformly distributed, but generally, lapis is stained. The mineral composition, except lazurite, influences also in the color. Well-distributed pyrite highlights the color with a bronze golden shade. An excess of the same minerals also gives lapis a boring green dye. The majority of high quality lapis admirers and collectors also agree that is better when there is less calcite. Lapis lazuli has been mined from Afghanistan since the seventh millennium B.C. and has been used since then. The best mineral came from the mines of Badakhshan (today Afghanistan) imported to Europe through Venice. Other deposits are found near Lake Baikal in Siberia and in the Andes. There is no evidence of ultramarine pigment use by Egyptians, Greeks and Romans. The lapis lazuli itself was quite famous among this nations, but not its pigment apparently. 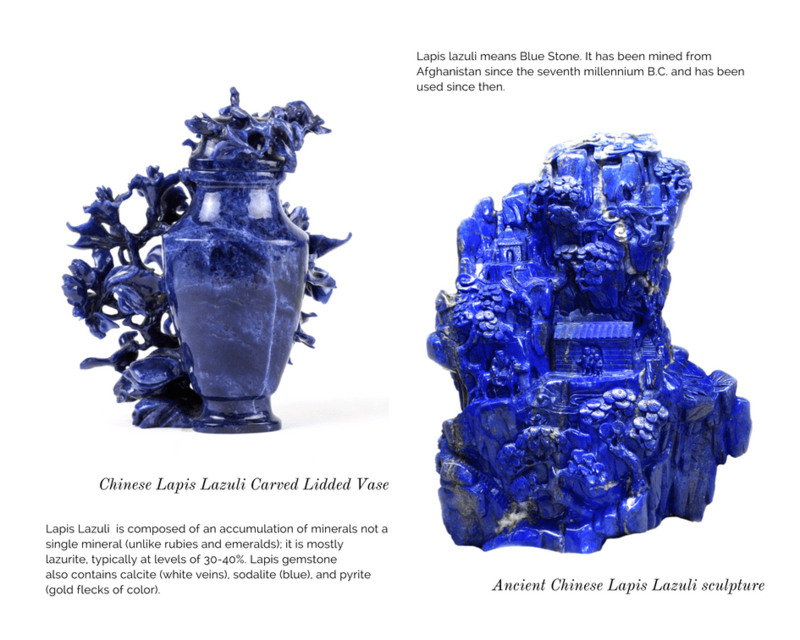 The first known use of lapis lazuli pigment as we know it now dates back to the VI and VII centuries, in paintings of Zoroastrians and Buddhist temples in Afghan caves. This pigment has also been identified on Chinese paintings from the X and XI centuries, on Indian murals from the XI, XII and the XVI centuries. Also on illuminated Anglo-Saxon manuscripts from 1100. Used during the Romanesque and Gothic periods to coloring illuminated manuscripts: Bibles or books of psalms that contained illustrations of the biblical passages were dyed in azure blue. Among the earliest Christian manuscripts are the Lindisfarne Gospels, written and illustrated at the Northumbrian Abbey of Lindisfarne on Holy Island around 698. It has touches of Lapis Lazuli Pigments. In its seventh and eighth century, the monastery was wealthy enough to afford the skills and materials to create the Gospels. In fact, the monks were the ones who controlled all the pigment commerce, including ultramarine blue. The monastic network provided inspiration and hospitality to the traveler. It belonged to the Benedictine monastery of Bury St Edmunds. Ruined by the Reformation, Bury had been throughout the middle Ages one of the grandest monasteries in western Europe. It was commissioned around 1135. According to Wikipedia, the first recorded professional artist in England created this magical work of art. Called Master Hugo. The illuminations were magnificent. One of the most distinctive illuminations was the one with the Moses cycle. With Moses explaining the Ten Commandments to engrossed Israelite’s. Also commissioned by the Benedictine Order and made in the Christ Church, Canterbury in the middle of the twelfth century. It has spectacular ornamented initials. The heavenly lapis lazuli was reserved for the holiest biblical characters. One of the most impressive manuscripts is the Trinity Apocalypse. No one knows who wrote it but was made in the mid-thirteenth century. It is an enormous, sumptuous apocalypse. It has an image where vermilion dragons swirl out of lapis lazuli skies to attack lapis-robed virgins who are rescued by lapis-draped angels. Commissioned by Henry of Bois at the end of the twelfth century. Experts estimate there were about six hands at work on the illuminations. Their nicknames were: Master of the Leaping Figures, who painted a lavishly lapised ”D”, showing Solomon and the prophets accepting the book from the wise man in the Book of Wisdom. The Master of Genesis Initial, the Amalekite Master, even the Master of the superb full-page Morgan Leaf who had the audacity to paint over a design of the Master of the Apocryphal Drawings. Written and illuminated around 1153 for the canons of Floresse Abbey in South-east Belgium. Ultramarine was used extravagantly in the frontispiece to volume two with the left hand miniature illustrating ‘The Virtues and Corporeal Works of Mercy’ and the right hand miniature illustrating the Transfiguration. Created in that Crusader world of twelfth and thirteenth centuries. The Floresse Bible is now in The British Library. It was created in the scriptorium of the Church of the Holy Sepulchre in Jerusalem between 1131 and 1143. The text is in Latin and was illustrated by one Basil. There is an image where Christ appears standing on a huge rock of Lapis Lazuli. These Bibles were commissioned by large wealthy monasteries with well-established scriptoria. However, there were also smaller, more personal illuminated books. It was made for the Benedictine Abbey in Dorset between 1400 and 1407. This manuscript is digitally displayed in the British Library. On the illumination for Christmas Day the Virgin lies robed in ultramarine on a vermilion rug with an anxious Joseph hanging over her. There is full page Crucifixion with Mary (in blue) below the cross. At the end of the Middle Ages, with the opening of commercial routes between the Byzantine Empire and Western Europe, lapis lazuli was transported by sea and land from East to West. There it was ground into pigment, being the finest and most expensive of all blue pigments. This pigment known as “ultramarine” was very expensive, so sometimes it cost up to 4 times more than the gold itself (calling the mineral as “blue gold”), hence it was so demanded by the best painters. You really can said that at the time of the Renaissance it was a mineral only suitable for the richest of society. Later, after the Renaissance, blue was the rule for the design of the mantle of the Virgin Mary, a privileged character throughout the history of art for always wear those blue mantles, as expensive as a gold tunic. One artist who insisted on using natural ultramarine was the Dutch artist Johannes Vermeer (1632-1675). We can appreciate the use of ultramarine in these beautiful examples of Vermeer paintings. Woman in Blue Reading a Letter painted in 1662-1663 (Rijksmuseum in Amsterdam) and Young Woman with a Water Pitcher (1664-1665) Metropolitan Museum of Art, New York. Michelangelo could not afford ultramarine. It is said that his painting “The Entombment” was left unfinished as the result of his failure to procure the prized pigment. Rafael also reserved ultramarine for his final coat, preferring for his base layers a common azurite; Vermeer was less parsimonious in his application and proceeded to mire his family in debt. Embodied in its name is the quality of the shadow of this pigment. Ultramarine can be found in almost all Vermeer’s paintings. Not only is it to be found in blue-colored objects, but traces can also be detected in shaded areas of white draperies, black marble tiles, green foliage, white-washed walls, shadows, and even the warm oranges and browns of wood and also clothing. Vermeer realized that adding natural ultramarine to shades of grey gave them the characteristic brightness of intense daylight. He used the pigment to create bright white light. To do this he mixed ultramarine with lead white to cover the warm brown of the canvas. So, how can even you make an ultramarine blue pigment from lapis lazuli? There are numerous medieval recipes for the making of lapis pigment. One formula was from the Benedictine monk Theophilus in the twelfth century. Another formula, which is also used today, is the one from Italian painter Cennino Cennini, who lived in the fourteenth to fifteenth century. Ultramarine is a colour illustrious, beautiful and most perfect, beyond all other colours; on could not say anything about it or do anything with it, but its quality would not still surpass. Choose a good stone and ensure you have the correct quantities of all ingredients. So, what needed to be done according to Cennini formula get the ultramarine blue pigment? Get some good blue lapis lazuli and pound it first in a bronze mortar, then on a porphyry slab. Sift it and pound again. Keep the ball for three days and also nights, working it a little every day. To extract the blue, suspend the ball in a basin of warm lye. Then knead between two sticks (the lye is caustic). Afterwards squeeze out the blue colour into the lye. Let it settle. Pour off the lye and let the blue dry as powder. Repeat the process over several days until no more blue is extracted. The dough retains the foreign particles, but the fine particles of lazurite settle in the alkaline water. The first extraction gives the purest blue; each successive extraction is less and less blue until only a grayish colour remains – “ultramarine ash”. Bear in mind that if you have good lapis lazuli, the blue from the first two yields will be worth eight “ducats” an ounce. Production of lapis lazuli pigment was such a hard work, so the artists would have employed a range of apprentices, students, and maybe even slaves to do the hard work. In the video below you can watch the whole process describing the whole manufacture of ultramarine made old way. Nowadays, some pigments arrive ready to use, already mixed with honey. Others are mixed on the spot with egg yolk. Cennini ha a special recommendation oh now to mix egg yolk with lapis lazuli powder. He even distinguished between the yolks of town eggs, and that of country eggs. Wash in egg yolk to clean. Pinch egg yolk to break the membrane. Mix the lapis lazuli with the yolk but DO NOT MIX it with water. It is translucent enough. Ultramarine blue made from lapis lazuli is one of the few natural pigments which has a permanent and vivid blue color, good opacity, and high stability. It has always been very expensive and today can sell for over $1,000 per pound for the highest quality. Nowadays, there are different techniques, but Cennini’s formula is the base of all. With all existing formulas 4 blue pigments can be obtained: Fra Angelico Blue, Pure 1st grade pigment, Ultramarine Ash, Lapis Fine Powder. Starting in the mid-1800s, artists and chemists began developing synthetic blue pigments for use as alternatives to ultramarine blue made from lapis lazuli. Some of these pigments also bear the name “ultramarine.” An artist who wants an ultramarine pigment made from lapis lazuli today must be sure that the pigment is not synthetic and is actually made from lapis lazuli. 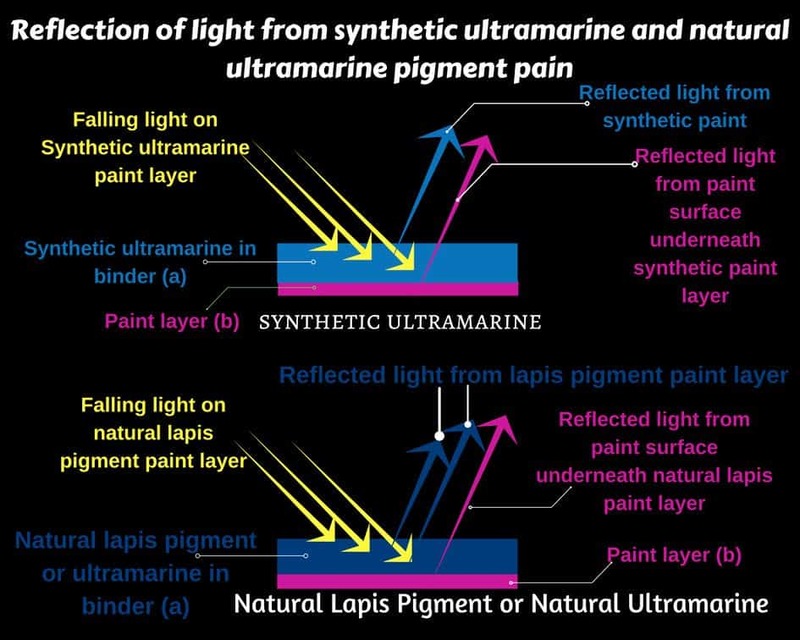 Synthetic ultramarine pigments have their advantages. Their blue color is usually deeper and more consistent than traditional ultramarine, and they also cost far less. For its expensive cost, the search for synthetic ultramarine was assigned to the Societé d’Encouragement pour L’Industrie Nationale. In 1824, the Societé d’Encouragement offered a prize of six thousand francs to anyone who could produce a synthetic variety not to exceed three hundred francs per kilo. On February 4, 1828, the prize was awarded to Jean Baptiste Guimet who submitted a process he had secretly developed in 1826. Guimet’s ultramarine was sold for four hundred francs per pound. This made it adopted by painters soon, without saving it in their mixtures with other pigments. However, the natural pigment continued to be manufactured until the mid-twentieth century for those artists who can afford it, among whom was Salvador Dalí. Independent of Guimet, Christian Gottlob Gmelin, a professor of chemistry at the University of Tubingen discovered a slightly different method based on the analytical results of Désormes and Clément, which he published only one month after Guimet. Gmelin claimed that he beat Guimet and a rivalry ensued for years but France upheld Guimet’s right to the prize. By about 1830, Guimet’s ultramarine was being produced at a factory that he opened in Fleurieu-sur-Sâone, France. X-ray diffraction analysis shows that there is no crystallographic difference between natural and synthetic ultramarine. However, the particles of the lapis lazuli pigments are more transparent allowing more light to pass through them allowing greater light reflection. At the same time, synthetic pigments do not allow much light to pass through them, absorbing most and reflecting little. The lapis pigment particles are far more transparent allowing more light to pass through them also allowing greater reflection of light. While synthetic pigment particles do not allow much light to pass through them absorbing most of it and reflecting little. The natural ultramarine blue has a high stability to light and records have shown a painting 500 years old, which has as pure and intense a blue color as freshly painted. In addition, the natural pigment is superior in terms of chemical resistance and tone, because it has a finer and more delicate color than the artificial one. It is suitable for every medium, equally excellent with oils, water and egg tempera. 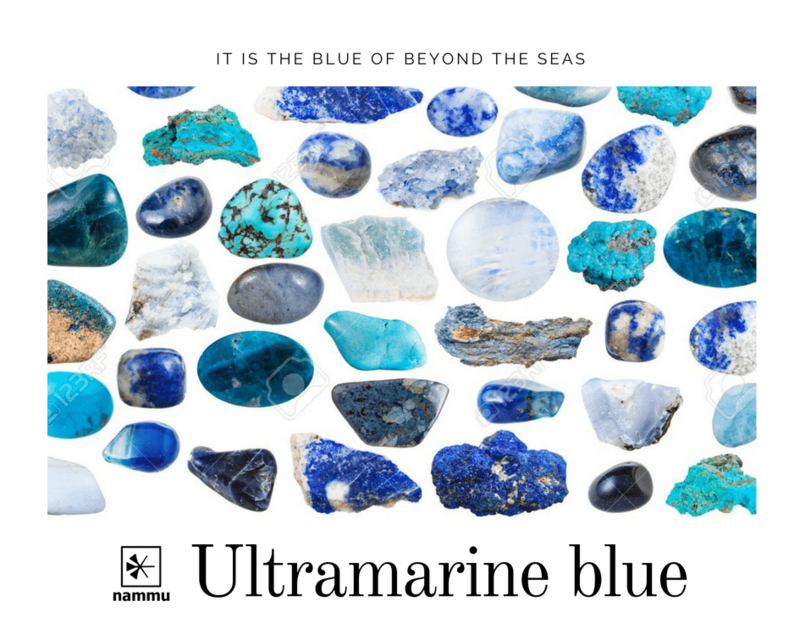 Ultramarine is well suited to make works of art more distinguished and alive with its gemstone energy. – Blending – it can be blended with any colour, giving smooth and velvety brush strokes. It imparts luminosity to every color it is blended with. Magical Lapis that will stay with us for a long time through are Arts History. Embodied for eternity in the incredible master pieces the great artist left us. Nowadays it is still a much appreciated mineral and used in jewelries, as much for its beauty as for its properties. I invite you to check out the beautiful models of our lapis lazuli jewelry offered by Nammu.